"Tulsa University started out as the Presbyterian School for Indian Girls, founded in Muskogee in 1882 and chartered as Henry Kendall College in 1894. The school moved to Tulsa in 1907 and became The University of Tulsa in 1921." 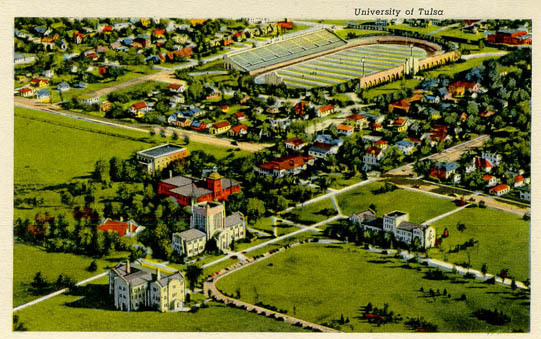 How Tulsa University has changed from the time of this postcard until today. I don't know the date of this postcard, but it has to be many years ago. Does anyone have any idea about when this postcard picture was taken? The University of Tulsa had its beginning as a missionary school at Muskogee under the support of the home missionary board of the Presbyterian church in New York City. In 1894 it was given the name of Henry Kendall College in honor of Rev. Henry Kendall who, for 30 years, had been secretary of the home mission board. Later the members of the board and synod desired to locate the school elsewhere, where it would receive more financial support and be more centrally located and cities were solicited to make bids for it. Many of the towns made offers, including Muskogee. The proposition from Tulsa was far better than that received from any other place and the school was moved here in 1907.